A city in northern Jiangsu, Suqian has rich tourist resources. Both Hongze and Luoma lakes present a charming scenery with fishing boats sailing on the water and birds finding homes in the lakeside areas. The major scenic attractions include the native place of Xiang Yu the Conqueror and the temporary palace of Emperor Qian Long of the Qing Dynasty. 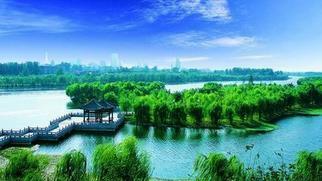 hectare temporary palace is in Zaohe Town, on the southern shore of Luoma Lake of Suqian City. It faces south and features a symmetrical layout, double eaves, and bucket arches. The temporary palace is composed of more than 20 halls, pavilions, towers, and kiosks.